Foley Lyman Law Group LLP has broad-based experience and achieved positive outcomes for clients at all levels of legal representation in Employment and Business Law as well as Trial Mediation and Arbitration. When you need to find a law firm you should base your choice on the collective legal experience of the lawyers and proven outcomes. It also helps to be the “bigger fish in a smaller pond” so your case doesn't get lost in layers of organizational bureaucracy. With Foley Lyman Law Group, you come first. With Shannon Foley and Judge Richard Lyman you are assured of effective, affordable legal representation by senior lawyers who provide personalized service and winning results. Ms. Shannon Foley and Hon. Richard Lyman (Judge, Retired), have nearly 60 years combined experience as employment and business lawyers, litigators, mediators, arbitrators, trial lawyers, and as a judge. They are tough on behalf of their clients yet compassionate toward their clients. Both Shannon Foley and Richard Lyman have been named by their peers as Preeminent AV lawyers -- the most honored and respected rating for legal ability and ethics an attorney can receive -- listed in the national Martindale-Hubbell Directory. Richard Lyman was voted 2005 “Judge of the Year” in Long Beach. 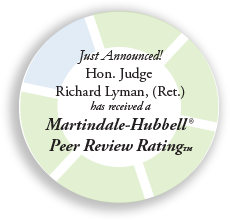 With more than 37 years of experience as an attorney and a Municipal and Superior Court Judge, Richard Lyman has not only heard evidence and tried cases but decided cases. As a client, you benefit from the per spective of someone with vast experience on the bench as well as long service as a mediator and arbitrator. 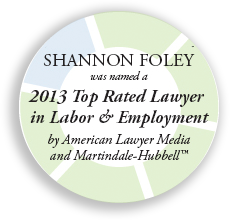 Shannon Foley is a leading employment Super Lawyer. She has been awarded as Southern California Super Lawyer for the past five years by Los Angeles Magazine for Top 5% of Attorneys. Both Shannon Foley and Richard Lyman are successful mediators experienced in the arbitration and mediation processes. They are available for mediations in the South Bay, Los Angeles, Long Beach, and Orange County. Richard Lyman also serves as an arbitrator and discovery referee. He is a panelist with ADR Services, Inc. -- a provider of mediation and arbitration – in Los Angeles and Orange County.